Big Innovations for the littlest people. Founded by Dr. Saadia I. Mohammed, Palm Beach Pediatric Dentistry is a perfect blend of high-quality professional dental care matched with a child-friendly environment designed to put patients – and their parents – at ease the minute they walk in the door. It not just a dental office, it’s a dental home. Holistic dentistry, also called natural or organic dentistry, emphasizes maintaining a natural environment within the mouth, and promotes the health and wellness of the entire individual. Dr. Saadia is a recognized expert in a surgical procedure to reverse Ankyloglossia (commonly called a ‘tongue-tie’). The process, called a frenectomy, removes the connecting tissue, allowing the tongue to move freely. Built on the philosophy that trust is the cornerstone of the relationship between patient and dentist, Palm Beach Pediatric Dentistry focuses on creating a stress-free, fun atmosphere where you’re greeted by name and where everyone from the dentist to the front office staff treats patients with respect – no matter how young they are. Complete with a play area, fun paintings on the walls and a staff well schooled in the art of making balloon animals, Palm Beach Pediatric Dentistry – led by board-certified pediatric dentist Dr. Saadia Mohammed – is equipped with the latest technology used to provide minimally invasive treatment that reduces pain and fear. 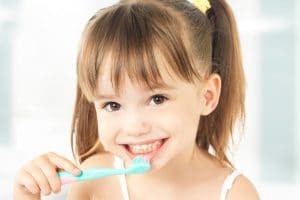 Taking a holistic approach to pediatric dentistry, which recognizes that health, nutrition, behavior and environment all play an important role in oral health, Dr. Saadia charts a prevention-focused course of action for her patients that establishes a life-long, positive dental-care regimen. At Palm Beach Pediatric Dentistry, it’s not just about fixing teeth. It’s also about creating positive relationships between children and their dentist that will last a lifetime. Holistic Dentistry acknowledges and deals with the mind, body, and spirit of the patient, not just his or her teeth. Laser Tongue Tie Release for Newborns can help your infant feed better and feel better in just one office visit. We are proud to be the only pediatric dentist in South Florida to offer laser dentistry with the Solea laser. Deb, Mother of Anya, 6; Elizabeth, 8; and Connor, 10. Shannon, Mother of Gavin, 8; and Mason, 10. Dr. Saadia and her team at Palm Beach Pediatric Dentistry run an innovative practice that delivers state-of-the-art oral health care to children. As a Boca Raton Pediatric Dentist, Dr. Saadia provides gentle pediatric dental care to children in the Boca/Palm Beach County area. Pediatric Holistic Dentistry encompasses not only the dental care of the patient but the whole individual. This modern approach to pediatric dentistry looks at the whole child, not just their teeth. Health, diet, behavior and environment all play important roles. While regular brushing and flossing play an important role in oral health, good nutrition keeps growing children strong from the inside out. Boca Raton Pediatric Dentist Dr. Saadia teaches that a wholesome diet high in veggies, fruits and whole grains plays a key role in the child’s immune system. When your child is healthy, their immune system is strong, making them less exposed to developing an oral disease. Engaged on the holistic philosophy, Palm Beach Pediatric Dentistry uses Laser Dentistry to give children the most comfortable treatment possible. The Solea Laser uses a potent combination of energized water and light to safely perform a variety of dental procedures that would otherwise use a damaging drill or scalpel. This advanced technology is also utilized in the office to perform a procedure called Frenectomy. When searching for Boca Raton Pediatric Dentist that offer this infant tongue or lip releasing procedure, Dr. Saadia has been highly recommended by lactation specialist in South Florida. When a newborn is struggling to breastfeed because of constricted movement of the tongue or lips, a frenectomy with Laser is proven to be the best and least painful choice. Dr. Saadia received her pediatric dental specialty training at University of Connecticut and spent a year doing her Fellowship in Pediatric Dentistry at Yale New Haven Hospital and Children’s Medical Center in Hartford, Connecticut with the Craniofacial team there. In addition to being the first female board certified in pediatric dentistry in Boca Raton, she is an active member of American Academy of Pediatric Dentistry. Her dedication to pediatric dentistry, along with kind touch makes her the preferred choice not only by parents but by the kids too. Her entire office is setup to help the children to get comfortable. Her passion for holistic dentistry inspires children to pursue a healthy lifestyle and consequently healthy teeth. To schedule an appointment or for more information, please give us a call at (561) 477-3535. Download Dr. Saadia’s E Book.